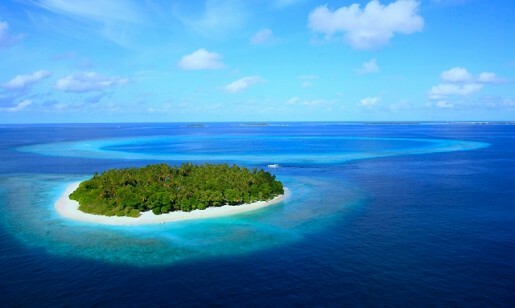 Bandos Island Resort is a perfect setting for that romantic getaway or those two weeks of bliss away from work. The sense of calm and serenity the island emanates is truly otherworldly. The gentle lull of the sea, the whistling breeze, and the rustling of the palm fronds on the beach will help transcend you from the hurly-burly rigours of daily life. Bandos Maldives offers you a wide choice of accommodations, however, comfort, luxury and convenience are the hallmarks of all our 225 rooms. From the ultra-exclusive and luxurious Water Villas, to the Jacuzzi Beach Villas with their beach-hut inspired design and en suite Jacuzzi, or the Garden Villas designed to cater for those who wish to remain in close proximity to nature, the accommodation options here at Bandos Island very clearly reflect the diverse tastes and requirements of our clientele. In a similar vein, the simple elegance of the deluxe and standard rooms are for those who simply seek to experience the Bandos way of life. Standard Rooms – With their simplistic elegance, quite strongly reflect all that is good about Bandos; the unyielding attitude towards settling for anything less than the highest quality and unrivalled customer satisfaction. Deluxe Rooms – Spacious and inviting, while offering a wide range of amenities. 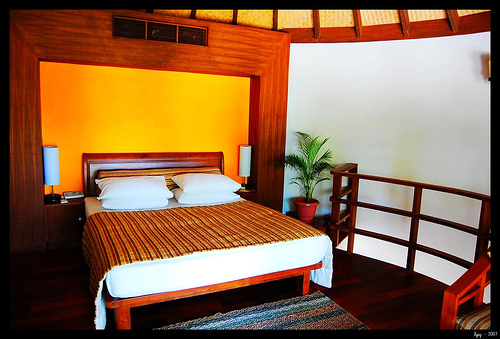 The rooms are designed in such a manner that both the living and bedroom areas are topped off by unique thatched high ceilings. Garden Villas – With their neatly trimmed hedges and flower gardens are designed for those who want to while away their vacation in the elegance of a carefully tended garden environment. Located in the middle of the island, near the new swimming pool facilities, these wooden chalets are elegantly furnished and come with their own private patio. Jacuzzi Beach Villas – Set on a strip of white sandy beach overlooking a crystal-clear lagoon blessed with abundant sunshine and tropical flora of unspeakable beauty, the Jacuzzi Beach Villas at Bandos will singularly make your stay on Bandos a most memorable occasion. Fashioned as a duplex, the living and bedroom facilities boast of all the requisite amenities necessary for your comfort and satisfaction. The balcony provides a pleasant view of the beach front, while the gentle rumble of the surf is constantly soothing. In the seclusion of your Beach Villa, surrounded by lush tropical vegetation, is the open-air Jacuzzi with its thatched roof shade designed for your relaxation and enjoyment. Water Villas – Features unique décor and breathtaking views of the ocean and beach, giving you the feeling that your villa is floating on the ocean. It offers luxury and tranquillity with full privacy and services exclusive to the villa. The living quarters come fully furnished with modern amenities, while the defining feature of the bedroom is the ornate four-poster bed whose elegance is certainly worthy of royalty. The ultra-luxurious and roomy Jacuzzi, set amongst lush tropical indoor plants and imported river pebbles, affords one an uninterrupted view of the ocean and the unending horizon. At Bandos Water Villas, one can simply while away many a moment on such simple pleasures as enjoying the sunset, a romantic soak with a loved one or, as they say in these isles, mastering the art of doing nothing. Rejuvenate your body and mind while enjoying a perfect holiday in Bandos, through a splendid spa treatment at Anggerik Spa. The private villas and cabanas at our spa offer intimacy and privacy. The Eastern architecture is just a glimpse into the time-honoured Asian therapies. From facial treatments that revitalize the skin, to ancient Balinese therapies, Anggerik Spa provides a healing experience for all. An exclusive spa package for couples offers a romantic spa journey while children relish the Junior Spa treatments for young guests. Our experienced and skilled therapists ensure a healing, soothing and charming spa experience. The “Kuda Bandos Sunset Wedding” features a taste of a traditional island ceremony, with a sunset boat ride, unique cultural costumes, Maldivian drums and local style decoration. The ceremony is held on the beach of an uninhabited island called Kuda Bandos followed by a private cruise for the newlyweds on a Dhoni (Maldivian boat). After which, enjoy a romantic private dinner set on the beach of Kuda Bandos. This is a uniquely tropical Maldivian experience.